When I first started working as a psychiatric aide, I gained a great appreciation for scrub suits. It is unfortunate that the traditional nursing uniforms (the all-white uniform) have now been laid to rest and have been replaced with scrubs that not only give you more comfort but it is also more practical. It's also great that you have a choice at different colors and designs--- well if you're female that is. Men on the other hand are stuck with the plain blue scrubs. Well you do have a choice of light blue, dark blue, aqua blue, and black (not really a color). Although I do wish for more choices for male nurses but I guess we have to make do with what we have now. I’ve recently been out shopping for scrubs and I’ve been surprised at how expensive some scrubs could be. Even with my 10% student discount, scrubs would still cost me around $40 to $80 for a set. 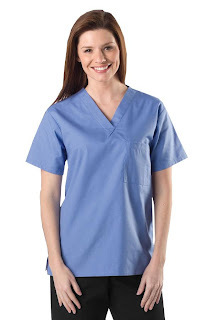 Makes me wonder why they’re so expensive, but it does help to know some cheaper alternatives like buying scrubs online like at http://www.nursinguniforms.net/. They have really affordable scrubs so you could buy a dozen so you won’t be stuck wearing the same scrubs in a monotonous cycle. They have a decent selection of scrubs and I’m pretty sure they’ll be adding more brands soon. With a purchase of $100 or more you will get free shipping so you could spend more on scrubs and less on having it sent to you. 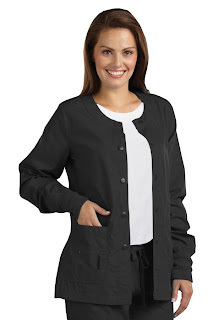 I especially like the warm upscrubs, great for chilly mornings or frigid nights. Another neat feature of http://www.nursinguniforms.net/ is their blog. I really found it interesting how the nursing profession’s history and other nursing concerns are laid out and discussed thoroughly so it is a great site to visit to know more about nursing. As a special treat to all nurses and everyone else who works in the health care field, Nursing Uniforms will provide a 20% discount when you use this coupon: NU2011. A great way to start spring would be to throw away your dark, gloomy scrubs and buy yourselves bright, new scrubs. ADAR Medical Uniforms feature an array of stunning print fabrics as contemporary medical scrubs uniforms in stylish cuts and fits. They incorporate such lovely details as ruffles, ties, novelty pockets and solid contrast trim binding. Thanks for a wonderful piece of writing. Have a good day. I love wearing medical scrubs since it gives me a wide array of designs. there are what we call solid scrubs and designer scrubs. And I pefer wearing designer scrubs at work since it brings so much light to the people that I assist. Great thinking! There is wonderful about "Nursing Uniforms". I am impressed by the quality of information on this website. There are a lot of good quality resources here. I am sure I will visit this place again soon. You can find some information with it.